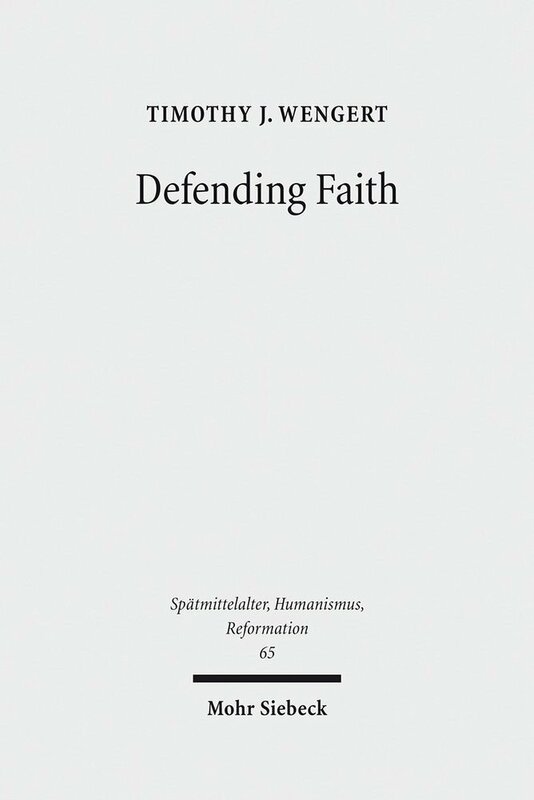 Timothy J. Wengert, Defending Faith: Lutheran Response to Andreas Osiander’s Doctrine of Justification, 1551-1559 [Studies in the Late Middle Ages, Humanism and the Reformation, vol. 65] (Tübingen: Mohr Siebeck, 2012), xiv+468pp. This monograph chronicles the development of a bitter controversy over justification that erupted in mid-16th century among heirs to Luther’s reformation. The controversy was occasioned by the teaching of Andreas Osiander, the “primary” theologian of Ducal Prussia, who rejected what he understood to be a merely declaratory conception of justification. He insisted, instead, that it was God’s essential righteousness that made believers righteous through the indwelling of Christ, according to his divine nature. Wengert’s intention is not to present an overview of Osiander’s theology. He seeks, rather, to fill a different scholarly lacuna through a painstakingly meticulous analysis of the controversy’s printed output (90 separate publications in some 125 printings just in the years 1550-1559). Osiander’s own voice is heard occasionally through his own writings, but, as Wengert notes, he was “if not outclassed then certainly outgunned” (353). Wengert’s chief focus is thus on how Osiander’s ideas were interpreted by his opponents and on why they met with such widespread condemnation. Adopting this lens allows Wengert to refract the Osiandrist controversy into a number of perspectives from which it might be approached. He discusses among others: (i) the types of response (printed or private), their genres, and the geographical, educational and theological provenance of the respondents; (ii) the likely and unlikely alliances that the controversy led to (such as that between erstwhile opponents, Matthias Flacius and Philip Melanchthon); (iii) the perceived doctrinal implications of Osiander’s ideas; (iv) and the nature of appeals to Luther’s authority. Of particular interest are the latter two. First, Wengert manages to show just how far-reaching were the consequences of Osiander’s understanding of righteousness, according to his opponents. The respondents emphasized variously the communication of properties between Christ’s natures, the Anselmian doctrine of the atonement, the theology of the cross, the need for pastoral comfort, the relation of theology to philosophy, etc. In addition, Wengert shows the complex hermeneutical issues attending the elevation of Luther to the status of a church father par excellence and the ultimate arbiter of sound scriptural interpretation. This multi-perspectival approach, in turn, allows Wengert to challenge, or nuance, various longstanding scholarly opinions. To begin with, Wengert’s research is inscribed into a larger effort to save Melanchthon’s reputation from the charges of doctrinal pussyfooting, and he does this with particular persuasiveness. Likewise, Wengert wishes both to distance the Swabian theologian, Johannes Brenz, from the unreflective charge of Osiandrian tendencies, while demonstrating Brenz’s clear desire to prevent the controversy from pastorally-harmful and politically-imprudent escalation. But Wengert’s goals go beyond textual archeology. His analysis seeks to illuminate the practical nature of 16th-century polemic, its pastoral focus, as opposed to an abstract or theoretical interest that aims at consensus by treating the opposing positions as equal (100, 194). However, the thrust of Wengert’s analysis of the variegated-yet-unified rejection of Osiander by a host of his theological contemporaries is aimed at the Finnish Luther research, especially the latter’s tendency to look for a soteriology centered on theosis in Luther’s theology. It is in regard to the latter that a critical point ought to be raised. Throughout the book’s exhaustive argument, Wenger’s attitude to Osiander, as a theologian, thinker, and polemicist, remains perceptibly negative. As he criticizes Osiander for speculative ontologizing, Wengert himself plainly favors a view of justification that centers on a relation (339), established through a Word event (316, 335). But it becomes clear that what Wengert rejects, via Osiander, as ontology is a Platonic notion of participation (he is more approving of Aristotelian notions of causality, deployed by Osiander’s opponents). Yet there is surely more to ontology in general, and the ontological implications of Luther’s theology in particular, than a simple juxtaposition between Plato (and Aristotle) and a relational event. The research of Oswald Bayer and others which aims to uncover the ontological underpinnings of Luther’s theology, grounded in the communicatio idiomatum, is a case in point. This said, Wengert’s work is a brilliant achievement in providing a staggeringly detailed and perceptive analysis of the Osiandrist controversy. As such, it illumines the nature of doctrinal consensus that drove late-Reformation and, to some degree, post-Reformation confessionalization. And it helps one to understand the theological and, above all, pastoral concerns that motivated the rise of Protestant orthodoxy. This review first appeared in Theological Book Review 25:1 (2013) 55-56.